Many I speak with tell me that they would love to sit on a board but that they would only consider a paid board role. I believe that only considering a paid board role is a mistake* and that an unpaid board role can be equally or more rewarding. As such I spend much of my time articulating the benefits of serving on a board other than just being paid. A recent review found that the average fee received by a Non Executive Director was $38,243. When you do the sums and take into consideration the time average taken for the board meetings (4hrs+), subcommittee meetings (2hrs+), travel (2hrs), pre-reading & preparation (6hrs + – I spoke recently with a client who had a board papers of 400 pages to read!) and attending the inevitable emergency meetings (2hrs+), the hourly rate for the vast majority of Non Executive Directors is pretty poor. For 12 meetings a year and taking into consideration all of the above this works out to be just under $200.00hr – and far less on many occasions. Many more do the sums and come to the same conclusion. If the remuneration is not terrific and the risks are high, why would you want a board appointment – particularly an unpaid one? Even unpaid board roles offer significant and tangible benefits. It is these benefits you should consider more closely – rather than whether you will be paid or not. I spend much of my time speaking with both aspiring and experienced NED’s. Those with lots of experience often tell me that the unpaid and often smaller board appointments that they hold are equally or more rewarding than the larger remunerated appointments. Why is this the case? Their responses to this question often revolve around their ability to be more involved in the business, to do greater strategic planning and they find that their skills, experience, networks and passion are used better. For these reasons and many more, I spend much of my time articulating the benefits of serving on boards even if they are unpaid. Whilst I do advocate that everyone consider unpaid board roles to complement their career, I am not sure how much traction I get – the lure, or necessity, of getting paid is strong. However, as I reflect on my own meager board experience, I am reminded how valuable the board work I do has been to my own executive career and could be to the people I meet as well. I recognise that, for many, the money they earn for sitting on a paid board is a significant amount of money but for those who already sit on a board that pay an ‘average’ fee, this may not be particularly significant or feel like a valuable ($$) use of your time. When you take into consideration the lost revenue opportunities, time out of the office, or the legal and financial risk that Directors face it is a wonder anyone is willing to consider a paid or unpaid Non-Executive Directorship. Why would anyone consider serving on a board, especially in an unpaid board role? Firstly, if not already sitting on a board by sitting on one you get to call yourself a ‘Non-Executive Director’. The benefits should not be ego related; rather this is a title that can leverage you onto other boards should you want them. You get to have non-executive conversations with other Non-Executives (outside of your board). Sharing Non-Executive experiences can be a great conversation starter and these conversations – with often influential individuals – can lead to new business and new opportunities. You get to learn the business of governance. If you are yet to sit on a board then an unpaid board role can be a great learning ground (as is a paid role if you can find one). You often get to network (around the board table) with ‘significant’ Non-Executive Directors – again increasing your opportunity to leverage these relationships into new board or executive business. I recognise that serving on a board is time consuming and risky. Nonetheless I think that individuals gain a number of unique benefits from sitting on any board regardless of whether they are paid or not**. So much so that I believe that if a board sitting fee is paid I think this should be regarded as a bonus. Whilst I do advocate that everyone consider unpaid board roles to complement their career I am not sure how much traction I get. But as I reflect on my own relatively meager board experience, I am reminded how valuable the board work I do has been to my own executive career. 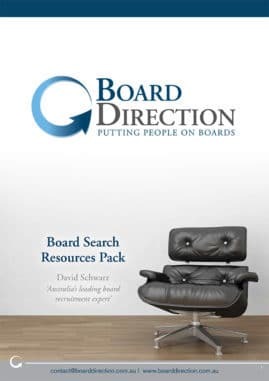 Board Direction advertise more than 100 board vacancies each month. Regardless of whether they are paid or unpaid roles, each of them offers an opportunity to further your career and offer tangible benefits beyond the sitting fees. Don’t wait, find out what roles are currently advertised. Over the past 10+ years I have helped many NED’s on the journey to their first or subsequent board role. One thing I have found more often than not, is that a lack of proper planning hampered their efforts and allowed many to give up on their dream of a portfolio career. In short, they basically had no idea where to start. For this reason I created my Career Planning Service. During a 2 hour one on one session, I help you put together a plan for developing your network, working with recruiters and achieving your board aspirations. But that’s not all! As a bonus, I also include a Board Ready CV to give you the best chance of daring them not to appoint you. Click here to book your Career Planning session and get your Board Ready CV. * Should individuals already have unpaid board experience or have a portfolio career where their sole income is derived from a limited number of board roles then it is reasonable that they only consider paid roles. ** I am a strong advocate for board members being paid. I think this is good business and, amongst other things, payments can often be used as a ‘stick’ to manage the performance of board members. I also think that by paying Directors you can attract a better quality of Board Member applicant. « How Much Does a Board CV Really Count when Looking for a Board Position?